Wes Peoples, founder and president of residential construction corporation Wes Peoples Homes, has a saying: Drive until you can afford it. 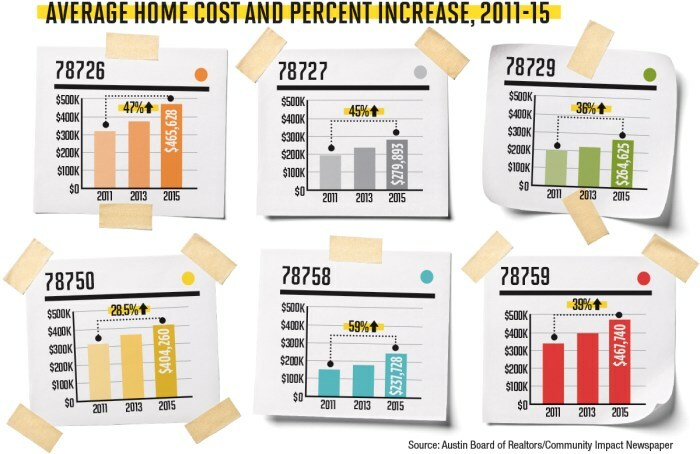 Rising home prices are driving young adults with children out of Austin and into outlying cities, such as Hutto and Pflugerville, where they can afford housing that fits their family’s needs, he said. Balcones Village/Spicewood resident Jim Hoe estimated property values have quadrupled since he moved into his home more than 30 years ago. After Westwood High School was built nearby on Mellow Meadow Drive in the early 1980s, it established a reputation as a quality public school, increasing the demand for housing among residents with school-age children, Hoe said. Now, he said, there are fewer schoolchildren in neighboring houses than there were 30 years ago. “Part of that may have to do with property values,” he said. According to data from the Austin Board of Realtors, the average home price in 78750, which is where the Balcones Village/Spicewood neighborhood is located, was $404,260 in 2015—28.5 percent higher than in 2011. 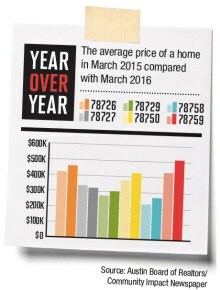 Homes prices in 78758 and 78727 in North Austin have risen 45 percent or more since 2011, according to ABoR data. “For homebuyers who can afford to purchase a home in Austin, that northwest area is one of the most desirable areas,” said Brandy Guthrie, 2015 president-elect for ABoR. Guthrie said Northwest Austin’s popularity is based on its infrastructure—homebuyers become part of established neighborhoods with access to major highways, shopping, hospitals and other amenities. But affordability is a challenge throughout the city, not just in Northwest Austin, Guthrie said. “A strong majority of [home] sales are taking place outside the [Austin] city limits,” she said. Guthrie said seven out of every 10 houses sold each month in the metropolitan area are sold in outlying cities, such as Round Rock, Pflugerville, Cedar Park, Buda and Kyle. Hoe said he sees more and more Austin residents relocating to Round Rock and Georgetown, where utility rates are more reasonable and people can afford larger homes on bigger lots. A young family working to afford their first or second home probably cannot afford to spend $400,000-$500,000 to live in his neighborhood, he said. According to data from Round Rock ISD—which has schools in Northwest Austin and Round Rock—more than 1,260 homes were constructed in the district in 2015, and about 1,180 home sales were completed. The largest number of RRISD’s home sales in 2015—15 percent—took place in Paloma Lake in Round Rock, a Wes Peoples Homes development where home prices start in the $200,000s, according to the data. The second-largest number of home sales—150—occurred in Northwoods at Avery Ranch, a David Weekley Homes development just outside of Cedar Park. No new home construction occurred in the areas that feed into Jollyville, Laurel Mountain, Pond Springs and Spicewood elementary schools, all of which are located in Northwest Austin, the data show. Total enrollment in RRISD is 47,645 for the 2015-16 school year. The district expects enrollment to surpass 48,000 by this fall and 50,000 by fall 2022. Northwest Austin continues to attract families who can afford to live there, said Aaron Farmer, broker and owner of downtown Austin-based Texas Discount Realty. Farmer has been working in the Austin real estate market since 1999. He said Northwest Austin attracts many tech employees who want to live near their place of work, whether it is the Apple Inc. campus off West Parmer Lane, National Instruments Corp. off MoPac or IBM Corp. on Burnet Road. Farmer said he lives in Southwest Austin, and he knows residents nearby who are planning to move north because they spend hours on MoPac during rush hour, he said. Farmer also said people with school-age children are attracted to Northwest Austin because of the caliber of schools in the area. Westwood and Anderson High School on Mesa Drive are some of the most popular schools in the nation, Farmer said. Peoples and his wife live in the Great Hills neighborhood where he said young families are slowly moving in because the neighborhood feeds into Anderson. Less expensive homes in the $300,000s are being constructed or rehabilitated in the areas surrounding Great Hills because parents want to send their children to some of the region’s best schools, he said. Peoples said families are also drawn to Northwest Austin because it offers easy access to shopping and medical centers. Lots in the area are larger, and housing stock is more affordable than in Central Austin, he said. “You’ve got The Domain. You’ve got the Arboretum. You’ve got just about everything you need out there,” Peoples said. Peoples said a different problem is arising in Great Hills: Empty nesters who want to downsize have little if any smaller housing options in the neighborhood. Although Peoples has lived in Great Hills for more than 20 years, he said he would likely sell his family’s home and move into something smaller with his wife in the Mueller neighborhood. Wes Peoples Homes is planning an infill development of 16 townhouses off Spicewood Springs Road, and Peoples said he hopes to start building in November. The units would range from 1,900-2,300 square feet and start in the $400,000s. “We anticipate most of the buyers will be empty nesters,” he said. Peoples also said he recently bought the last available land in Gracy Farms and is planning another infill development that will put residents near The Domain, IBM and the J.J. Pickle Research Campus. Peoples said when he first moved to Great Hills, Northwest Austin was considered the edge of town. Now, he said, it seems closer to the city’s center. “And it’s priced accordingly,” he said.